At 3342 metres, Shikari Mata is a roofless temple, dedicated to a hunting goddess. Legend has it, hunters used to worship the Goddess on the mountain for success in their hunt. The temple is connected to Janjehli town in Himachal Pradesh with a 18 kilometre fair weather road. In winters, this fair weather road is closed just after Janjehli due to heavy snow drifts. The trek from Janjehli to Shikari Mata along this closed road is difficult yet exhilarating trek. The trek is difficult because of the large distance to be covered in one day and some avalanche prone sections. Yet for its difficulty this trek offers beautiful views, the lack of need for navigation, solitude and a unparalleled sense of accomplishment. If you are contemplating a challenging winter trek, we recommend you try this trek to get your snow-craft and winter gear sorted. Undulating mountains en route to Shikari Mata. warned our resident weather expert over the telephone. We had reached Janjehli late in the evening and we were contemplating camping at Shikari Mata temple the next day. But weather it seems had other plans. 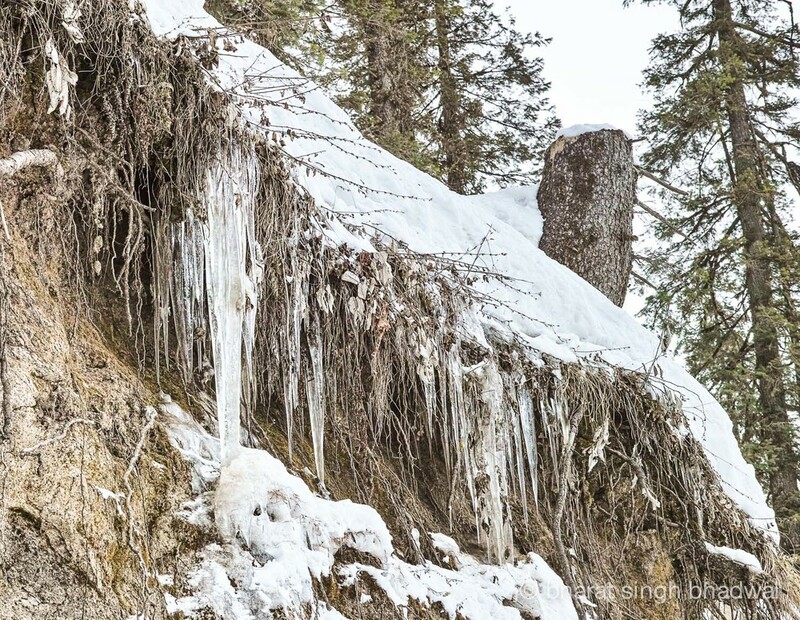 This year's winter has been severe in Himachal Pradesh and the Himachal Meteorological Department had predicted tomorrow to be the last sunny day for a week. Inclement weather and heavy snowfall was expected in and around Janjehli starting the day after tomorrow. This weather forecast meant that we had to complete a 28 kilometre trek, over a trail covered with snow drifts that the villagers assured us could not be trekked, in one day. In the evening we pondered over our dilemma as we repacked our gear. We decided to throw out the heavy camping gear and to use our daypacks for a quick and lightweight ascent. As an added security measure, we decided to set the turnaround time for this trek for 2 pm. It didn't matter whether we were a few feet or a few kilometres away from the temple; at 2 pm we would turn around and start walking back. Frozen Icicles along the road. Early next morning, we drove from Janjehli in our Maruti Gypsy equipped with a four wheel drive. Yet, just four kilometres later the Gypsy was struggling for traction through foot high snow drifts. At this point we decided to climb into our rubber shod snow shoes and start walking through the dense snow field that once was Janjehli - Shikari Mata road. Through forest and ridge, over fresh and untracked snow we made slow yet steady progress. Trail snacks and warm tea fuelled this steady ascent and saw us reach the temple at 1 PM, an hour before our scheduled turnaround time. Making tracks over an extra helping of snow. For the next hour we enjoyed the view from the roofless temple situated on a snow covered ridge. A quick lunch, a pair of fresh socks and some photographs later we were walking back on our way to Janjehli. We had hoped to meet some locals along our way but incredulously we met not one person, to or fro from the temple. At 5:30 PM as the sun was sinking behind snow clad mountains, we were back at our Gypsy after having walked for over 28 kilometres in just under 11 hours. A self-congratulatory cheer and a short drive later, we were back in Janjehli, resting our well worn heels at a local dhaba. At the dhaba, the villagers refused to believe that we had made it all the way to the temple till we exhibited the photographs on our cameras. At this point their incredulity turned into admiration and we were treated to a sumptuous dinner on the house. The next morning as we were stowed our gear in the Gypsy for our drive back to Mandi, the snow flakes started to fall. It turns out the Himachal Meteorological Department was right after all. The other end of the snow covered Shikari Mata ridge. Shikari Mata temple situated at an elevation of 3342 meters is 18 kilometres from Janjehli (2093 metres). Janjehli is small town and the last point on the Shikari Mata trail that offers boarding and lodging in winters. A fair weather road, connects Shikari Mata temple with Janjehli. In winters, this fair weather road is closed four or five kilometres from Janjehli due to heavy snow drifts. If you intend to complete this trek in one day, rent a jeep or a four wheel drive to get you as farther along the road as possible. However, If you choose to camp overnight at the temple, do remember it gets pretty darn cold in winters. Pick the right clothes and sleeping gear rated for minus 10 or below. Overlooking mountains to the North. The road to Shikari Mata temple starts from the "Y" junction just after Janjehli market. It is an easy walk for the first few kilometres. The climb is gradual and a few hamlets dot the roadside. The snow and ice starts to build up as you travel farther along this road. A serene mountain stream flows next to a snow covered meadow, dubbed as Janjehli Camping Ground. This serene spot along the stream is an excellent place to take a break and refill water for the rest of the journey. This is the last potable water point on this trek, after this you shall have to melt snow to get drinking water. Flora encased in its snowy sheath. After crossing the stream you shall be trekking through shin deep snow at least, therefore a good pair of snow boots and extra socks are essential. The next waypoint along this route is a bifurcation, two kilometres from the mountain stream, with a signpost that says "Shikari Matta 6 Km" (sic). Bifurcation to Shikari Matta (sic). Follow the trail to your right, from the bifurcation. This trail ascends through a dense forest. Some gaps between these snow covered trees offer beautiful views over the snow clad northern mountain ranges. The road hugs the ridge on the windward side of the mountain. In these last 6 kilometres, there are three sections where precarious snow drifts hang over the road. These sections may be avalanche prone and thus it is important to assess the snow before plunging ahead. After you have navigated the third avalanche prone section, you will come across a signpost and a staircase. A few hundred concrete stairs climb up the ridge, to the temple. However, these stairs are covered with knee deep snow and treacherous ice. Be careful, as this is the most gruelling ascent and the most precarious descent for this trek. The elevation of Shikari Mata temple is not 2850 metres, as claimed by several websites. 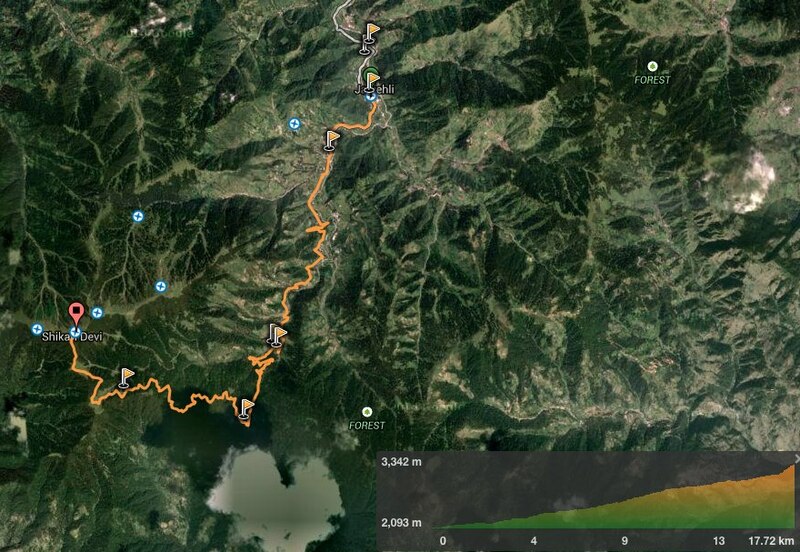 The correct elevation is 3342 meters (+- 5 metres), measured with a Garmin Etrex 20 GPS and an iPhone. Janjehli is well connected with Mandi (H.P.) by bus and taxi. Taxis can be hired from Mandi / Ner Chowk and Thunag for Janjehli. A daily bus also connects Janjehli with Delhi. Budget hotels, trekking lodge and guest houses are available in Janjehli. There are two rest houses, one maintained by the PWD and the other by the local village panchayat (see GPS logs for location). At shikari Mata temple there are prefabricated sheds. They are left open in winters and can be used for shelter. However, do carry your sleeping bags and mattress. Days are pleasant, however nights are very cold with temperature dipping below -10 degrees Celsius at the temple. Caution - This is not a trek for beginners, especially after a heavy snowfall. The route contains some sections that are avalanche prone. The last water point is 8 kilometres from the destination i.e. Shikari Mata temple. View / download GPS route from wikiloc. Click here. View / download GPS route from Google Maps. Click here. Apr 1 Quechua Forclaz 50 Speed backpack - long term user review. Almost perfect.